This is a stunning and hard to find creamware transfer printed Tazza or Raised Cake Stand. 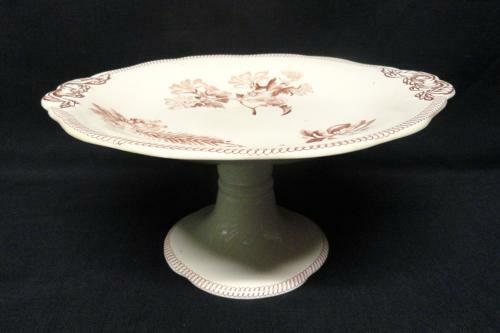 It is very finely molded, measuring 5 inches tall on a raised pedestal base, and measures 9 3/4 inches across the top rim. It is transfer printed in a rich chocolate brown or sepia, abundantly decorated around the perimeter with a series of fine botanical engravings. A spectacular composition of flowers from around the world! The interior rim as well as the base are decorated with a simple ring of interconnected circles, a fantastic example of Aesthetic movement Victorian love of naturalistic beauty. This piece is a perfect addition to any collection of Wedgwood creamware or Staffordshire transferware with botanical imagery . Never Used. The stand is in Excellent condition, with no chips, cracks, stains or repairs.